Sometimes the truth is darker than fiction. Liza Jones has thirty days to write the thriller that could put her back on the bestseller list. In the meantime, she’s struggling to start a family with her husband, who is distracted by the disappearance of his best friend, Nick. With stresses weighing down in both her professional and her personal life, Liza escapes into writing her latest heroine. Beth is a new mother who suspects her husband is cheating on her while she’s home alone providing for their newborn. Angry and betrayed, Beth sets out to catch him in the act and make him pay for shattering the illusion of their perfect life. But before she realizes it, she’s tossing the body of her husband’s mistress into the river. Then the lines between fiction and reality begin to blur. Nick’s body is dragged from the Hudson and Liza’s husband is arrested for his murder. Before her deadline is up, Liza will have to face up to the truths about the people around her, including herself. If she doesn’t, the end of her heroine’s story could be the end of her own. There is something about a book within a book that always intrigues me and when it’s done well it can be mind blowingly good. Lies She Told is done extremely well, it’s cleverly plotted, the protagonist is an author, (I LOVE books that give me a glimpse into the literary world) and is SO addictive, it really is unputdownable, I raced through it in one sitting. Ok, I did have to stop a few times, my kids wanted food. So needy. But I was totally engrossed by every single page of this twisty thriller. This alternates between Liza, an suspense author who has thirty days to deliver her next book and it better be good because her last novel? Forgettable. She’s undergoing experimental fertility treatments and dealing with the disappearance of her husband’s best friend, Nick. Beth is the lead in Liza’s work in progress, a young new mom who finds out her husband is cheating. The lines between reality and fiction are blurred when Liza’s real life is eerily similar to Beth’s fictional life. Or is Beth’s life real and Liza’s actually fake? Is Liza taking inspiration from her own life when writing Beth’s story? Unreliable narration at it’s finest ladies and gentleman, I had no idea who was telling the truth and then Holahan kept delivering killer twists that left me breathless. Lies She Told has SO many layers that slowly get peeled back, it’s one of those books where you really need to pay attention, both in Liza’s chapters as well as Beth’s. It’s highly complex but not confusing, the switch between narrators is seamless and I was equally engaged by both storylines. It’s intelligent and compulsive with a unique premise that will have you flipping pages faster and faster right up until the dramatic conclusion. I highly recommend this one for suspense lovers looking for a fresh, unique take on a psychological thriller! Sounds great, I’m of course a little hesitant since it’s a psych thriller…would you say it’s as good as Lie to Me?? I think so! If pushed I would say I liked LTM more though. This sounds brilliant! I love a good thriller so it sounds right up my street 🙂 Great review! Sounds pretty great Amy! Glad you enjoyed it! It’s great to see that the writer didn’t fail at writing this sort of book within a book! I love multiple layers and this sounds pretty awesome! Great review Amy! Yay hope you love it!! Ohh Ive been curious about this one because I read so many glowing reviews! And I also like a book within a boook, I’m tempted!! Ok then add this one!! 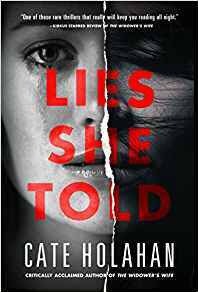 Check out the book, Lies She Told, by Cate Holahan, as featured on the Novel Gossip blog. Great review Amy! This one sounds like a “bookworm’s delight”. The synopsis reminds me a bit of Catherine McKenzie’s book, Fractured. I enjoyed Fractured, but this one seems a little more fast paced & exciting!